If you like slots that are based on their predecessors, then the lucky theme in the LotsALoot 5 Reel slot machine is sure to be a hit. Rainbows and pots of gold are at it again, but this time they're met with shamrocks and poker icons to create a fuller experience. 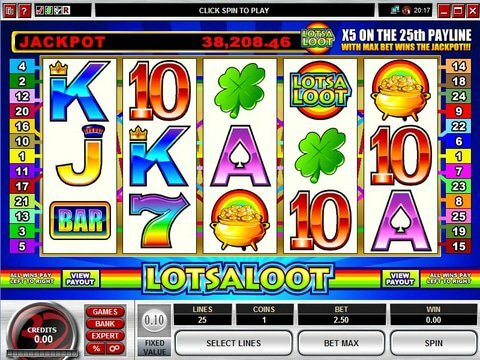 You can review it on this page with the LotsALoot 5 Reel free play slot demo that is available on your computer and most mobile devices with absolutely no download and no registration required. Just like its predecessor, this title is almost completely devoid of features. It's not the most exciting slot, but this is good news for those who just want to kick back. You can spend as little as a penny or as much as $2.50 per spin, and it's attached to the same progressive jackpot as its 3-reel counterpart. The Logo is wild and will substitute for all others to help you produce wins, and while there's no multiplier associated with it, it occurs frequently enough to make up for that. It's a simple machine as far as five-reels goes, and you're sure to enjoy it if you're into a relaxing atmosphere. If you want to try slot games for real money that packs a bit more of a punch in terms of features, then the Easter Surprise slot machine is just as visually appealing but has much more for you to enjoy. The betting range is massive at a penny to $200, and the jackpot tops out at a whopping 100 grand. You'll enjoy wilds and a scatter payout of 10,000 coins at most, and the free spins all come with a triple multiplier - they can be retriggered indefinitely, too. Don't let the cute Easter Bunny theme fool you. This isn't a game for kids!